Cluster bombs have an unusual wartime characteristic: the harm they cause, thanks to poor design, extends long beyond the conflict. Of the 260,000,000 fist-sized “bomblets” that the US covertly rained down on Laos between 1964 and 1973, some 80,000,000 did not detonate, and they remain, 40 years later, as deadly UXOs (unexploded ordnance). A farmer’s plow, a child’s curiosity, or even a step in the mud has the potential to kill. 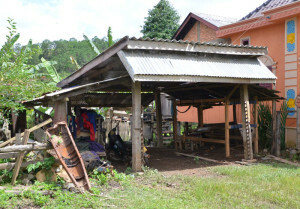 Today, Laos suffers a reported casualty every other day from this old ordnance. 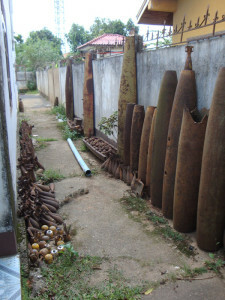 Cluster bomb casings support the shed room under which a loom is located. 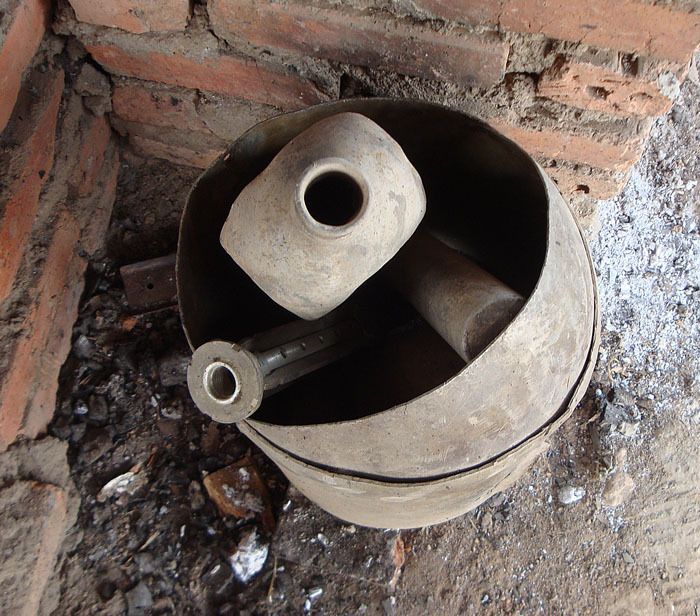 In Vietnam’s Quang Tri Province, 7000 civilians have been made casualties by UXO’s since 1974. In Lebanon, in 2006, two months after the cease fire, 3 to 4 civilans were still being killed daily by UXO’s. In Kuwait, over 1200 innocents have died from UXO’s left from 1991’s hostilities. Wherever cluster bombs have been used – Croatia, Iraq, Afghanistan, Libya, Chad, Syria (in 2013) and some 30 other nations – the civilian populations are made to suffer long-term consequence of the 30% of “bombies” that do not explode upon impact. And of the deaths caused by all cluster munitions since 1964, 94% of casualties have been civilians, and 40% have been children. Mortars, bombies, and cluster bomb casings on display outside the tourist office in Phonsavan. The good news is that 111 nations have now joined the Convention on Cluster Munitions; 77 have fully ratified its provisions. The bad news is that the US is not a signatory. Last month, U.S. Senators Dianne Feinstein (D-Calif.) and Patrick Leahy (D-Vt.) introduced the Cluster Munitions Civilian Protection Act, a bill to restrict the use and deployment of these dangerous cluster munitions that leave a legacy of death long after being dropped. Jim McGovern (D-Mass.) introduced companion legislation in the House. We at Above the Fray encourage you to contact your representatives and urge them to support the need for significant restrictions on the design and use of these munitions, starting with the provision in the law that requires a 99% detonation-upon-impact rate. Aluminum bomb & war refuse wait to be melted to make spoons in Napia. Above the Fray donates 15% of our profits to Mines Advisory Group, a Nobel-prize winning organization that helps civilians recover from the atrocities of war. In Laos and Vietnam, MAG educates the locals about UXO’s and leads teams that eliminate UXO’s from high-risk areas like school yards, tourist centers, and farmer’s fields. 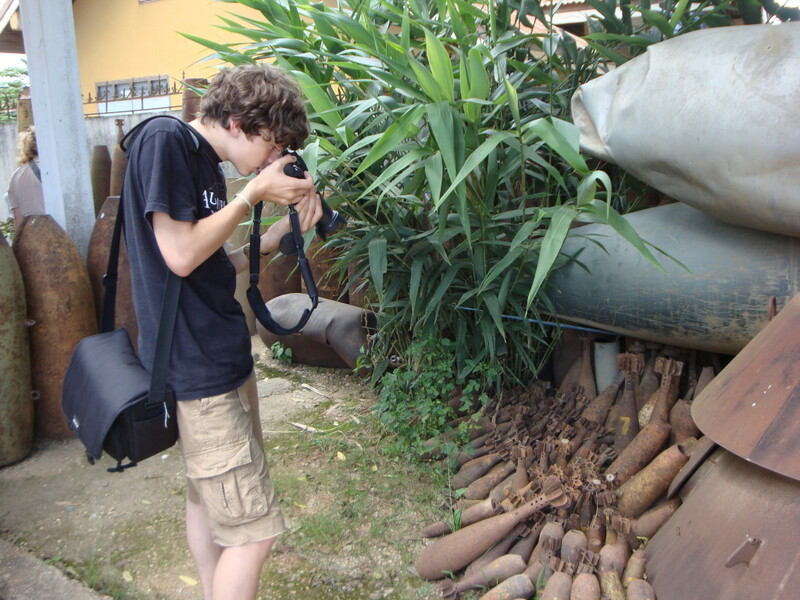 Zall at work photographing defused mortar shells and other bomb scrap.